Luxury goods and personal items imported from the metropole set elite colonial consumers apart from the rest of the population. In addition to a fan, the lady to the right is also holding a velvet mask, worn to protect the complexion from the sun. Elite colonial ladies also used masks. Marie-Rogère Le Page, the widow of a military officer, owned a sort of half-mask, known as a loup, upon her death in 1681. The loup was worn over the eyes and nose. Twenty years later, the 1703 inventory of Marie-Anne Roberge details her ownership of two full masks and five loups. Claude de Sainte's probate inventory included a black velvet mask as well as a child's mask in 1704. 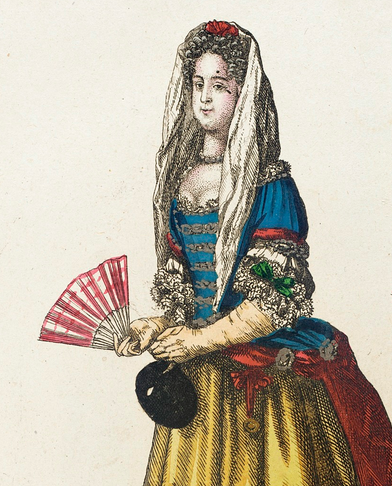 Masks, fans, and other metropolitan luxury goods could be purchased from colonial merchants, who procured their stock via French intermediaries in ports such as La Rochelle, Nantes, and Rochefort. These tortoiseshell fan slats were recovered from the site of bourgeois-turned-noble merchant and seigneur Charles Aubert de La Chesnaye's Québec townhouse. This large property fronted the Saint Lawrence River and was completed in 1679. Perhaps the fan belonged to Aubert de La Chesnaye's third wife, Marie-Angélique Denys de La Ronde. Born around 1661, she was the daughter of a French-born nobleman and a colonial-born noblewoman whose family emigrated from Normandy. Although her husband was a bourgeois at the time of their 1679 marriage, he was ennobled in 1693. Members of the Denys de La Ronde family were prominent inhabitants of both Canada and Louisiana. Discovered in the foundation of a circa 1600 home in England, the example to the left resembles the sorts masks in fashion from the late sixteenth through the mid-eighteenth centuries and worn in both Europe and colonial America. To wear this sort of mask, a woman bit onto a glass bead affixed to the back, imposing a certain silence and air of mystery.